Most of us who frequent the Himalayas are aware of the famous Jawalaji Temple in the town of Jawalamukhi in Himachal Pradesh where an eternal flame burns which attracts worshippers from far and wide. The Jwalaji Temple is considered one of the Shakti Peeths, which are Shrines dedicated to the Devi, the Mother Goddess. It is also supposed to be one of the most important Shrines of Goddess Durga. The Temple was established by Raja Bhumi Chand Katoch, who was a great devotee of Durga Ma and is situated on the Dharamshala Shimla Road. Interestingly no idol is worshipped in the Temple but instead a Flame which appears out of a crack in the Rocks and this is object of worship in the Temple. The source of the Flame is probably some natural gas deposits deep underground but as Religion and Science dont mix I leave it to your personal opinion as to what is the source of this eternal Fire. Moving on, in my usual rumblings and digging around I came across some references to this Temple being the “Small” Jawalajee and the “Big” Jawalajee being in, of all places, Baku, Azerbaijan. For those of you not aware Azerbaijan lies on the other side of the Caspian Sea at the point where Asia meets Europe. Its mostly a Mountainous country and the Caucasus Mountains which traditionally separate Asia from Europe is the main Mountain Range. Of course its not in the Himalayas but this Temple at the foot of the Caucasus Mountains has a religious connection with the Jawalaji Temple in the Himalayan foothills. Enough to invoke my interest in the same. And then I came across the Ateshgah of Baku, located in the Surakhani town of Baku city. It’s also called the Fire Temple of Baku and is a Castle like Temple. Atesh as some of you might be aware, is the Persian word for Fire and Gah means house and put together it literally means “House of Fire”. Ok it seems I am on the right track. The Central element “Fire” is point of commonality with the “Small” Jawalaji. The Temple complex itself is a Pentagonal structure with a tetra-pillar altar in the middle which housed an eternal flame which went out in 1959 though the Temple complex itself was abandoned in 1883 with the setting up of Petroleum plants in the town. The eternal flame was probably a sign of the huge hydrocarbon deposits that lay underneath. Azerbaijan today is a big exporter of oil and gas and it comes from the Caspian Sea. People aware of the Geopolitics well understand the ramifications if the term “Caspian Sea Oil” and i leave it that as that is not the subject of study here. 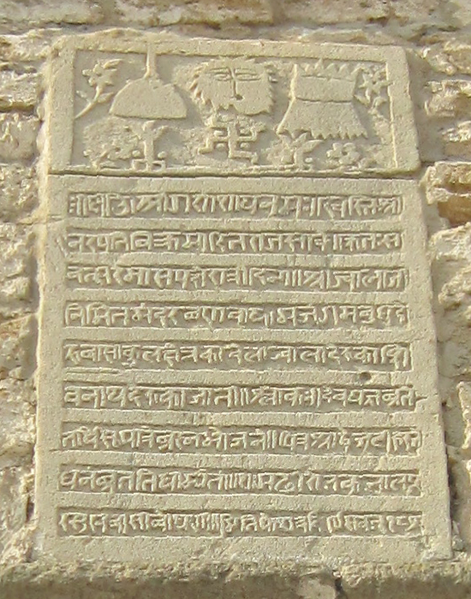 Coming back to to Atashgah, it has inscriptions in Sanskrit, Persian and Gurumukhi. And there is a Trishul installed on the top of the Altar.In an inscription from the Baku Atashgah. the first line begins: I salute Lord Ganesha (श्री गणेसाय नम) venerating Hindu god Ganesha, the second venerates the holy fire (जवालाजी, Jwala Ji) and dates the inscription to Samvat 1802 (संवत १८०२, or 1745-46 CE). The Persian quatrain below is the sole Persian inscription on the temple and, though ungrammatical, also refers to the fire (آتش) and dates it to 1158 (١١٥٨) Hijri, which is also 1745 CE. Besides this there is a seperate inscription in Sanskrit dedicated to Lord Shiva as well as an inscription in Gurmukhi dedicated to the Adi Granth. The present Temple has been dated to have been built in the mid 1700s as confirmed by the inscriptions as well. One early European commentator, Jonas Hanway, bucketed Zoroastrians, Sikhs, and Hindus together with respect to their religious beliefs: “These opinions, with a few alterations, are still maintained by some of the posterity of the ancient Indians and Persians, who are called Gebers or Gaurs, and are very zealous in preserving the religion of their ancestors; particularly in regard to their veneration for the element of fire.” Geber is a Persian term for Zoroastrians, while Gaurs are a priestly Hindu and Sikh caste. A later scholar, A. V. Williams Jackson, drew a distinction between the two groups. While stating that “the typical features which Hanway mentions are distinctly Indian, not Zoroastrian” based on the worshipers’ attires and tilakas, their strictly vegetarian diets and open veneration for cows, he left open the possibility that a few “actual Gabrs (i.e. Zoroastrians, or Parsis)” may also have been present at the shrine alongside larger Hindu and Sikh groups. Chardin in the 17th century reported about Persian Guebres, which worshiped forever burning fire that was in two days’ journey from Shemakha (on the Apsheron). Engelbert Kaempfer, who visited Surakhany in 1683, wrote that among people who worshiped fire, two men are descendants of Persians who migrated to India. French Jesuit Villotte, who lived in Azerbaijan since 1689, reports that Ateshgah revered by Hindus, Sikhs, and Zoroastrians, the descendants of the ancient Persians. German traveler Lerch who visited the temple in 1733, wrote that here there are 12 Guebres or ancient Persian fire worshipers». J. Hanway visited Baku in 1747 and left few records of Ateshgah. People, who worshiped fire in Ateshgah he calls “Indians”, “Persians” and “Guebres”. S. Gmelin, who visited Ateshgah in 1770, wrote that in the present Ateshgah lived Indians and descendants of the ancient Guebres. In 1820 the French consul Gamba visits the temple. According to Gamba here lived Hindus, Sikhs, and Zoroastrians, the followers of Zoroaster. And to the Jawalaji connection. The inscriptions in the temple in Sanskrit (in Nagari Devanagari script) and Punjabi (in Gurmukhi script) identify the site as a place of Hindu and Sikh worship, and state it was built and consecrated for Jwala Ji, the modern Hindu fire deity. Jwala (जवाला/ज्वाला) means flame in Sanskrit and Ji is an honorific used in the Indian subcontinent. There is a famed shrine to Jwala Ji in the Himalayas, in the settlement of Jawalamukhi, in the Kangra district of Himachal Pradesh, India to which the Atashgah bears strong resemblance and on which some scholars (such as A. V. Williams Jackson) suggested the current structure may have been modeled. However, other scholars have stated that some Jwala Ji devotees used to refer to the Kangra shrine as the ‘smaller Jwala Ji’ and the Baku shrine as the ‘greater Jwala Ji’.Other deities mentioned in the inscriptions include Ganesha and Shiva. The Punjabi language inscriptions are quotations from the Adi Granth, while some of the Sanskrit ones are drawn from the Sat Sri Ganesaya namah text. Now coming back to the Himalayas I would like to ask those who have been to Jawalaji or are learned on the subject can throw light on whether this “Bigger” Jawalaji reference is still remembered or has it been consigned to history. Maybe an old Priest at the Jawalaji Temple would have a clue. Also does the Ateshgah have any resemblance to the Jawalaji Temple as it stands today ? And lastly but not leastly has the Government of India done any research on the possible reserves of Hydrocarbons lying under the ground. “Big” Jawalaji rewarded the Azeris pretty well and with all the oil money their standards of living are almost at par with Europe. Maybe “Small” Jawalaji would hold similar rewards for us ? Also using Admin discretion for posting more than one pic as this story needs more than one pic to be told. If you have a story which you think needs more than one photo to do justice to it please get in touch with the Admins. This has been composed by most inputs taken from Wikipedia and the pics are from Wikipedia as well.